Since 2010, Sing Up has set aside a day each year to celebrate the power of song. The next Sing Up Day will be Wednesday 13 March 2019. With Sing Up Day now less than two months away, we have released new free digital resources to enrich schools’ experience. The Vocal Leader Pack has teaching ideas for singers of all age groups. We’ve included expert performance advice and an assembly plan that comes with a PowerPoint presentation. This will make it easy to use Sing Up Day to think about the power of singing together and building authentic connections with one another. 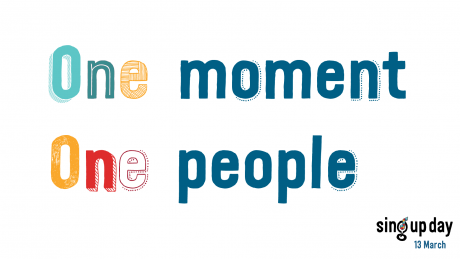 For lots of fun independent activities to get pupils thinking about the theme of this year’s song, One moment, one people, you can download the Pupil Pack. There’s even more available for free, including video learning aids and a fantastic playlist. To join in our tenth annual singing event on 13 March 2019, head to www.singup.org/singupday to hear this year’s anthem, One moment, one people, and add your event to our global singing map.